I made a trip to Lens Louvre last autumn on a cold rainy day. 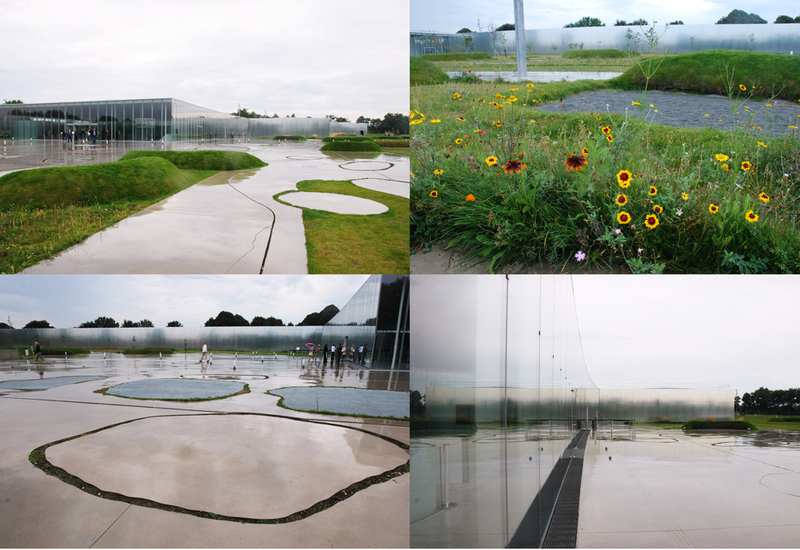 It has been designed by Japanese Architect firm SANAA, and is a stunning building. The Gallery site covers 20 hectares over a former mine yard in what is still quite an industrial part of northern France, the Nord-Pas de Calais region. The leaden clouds made for some really interesting pictures with the reflections on the concrete; the gallery magically disappeared into the sky. French Landscaping architect Catherine Mosbach designed the grounds. Very pretty, but the ridges in the concrete were proving somewhat problematic and dangerous for the older people around me, and I even witnessed an irate old lady getting her husband’s wheelchair stuck in one. Suggestion: fill them in with coloured concrete to retain the shapes.